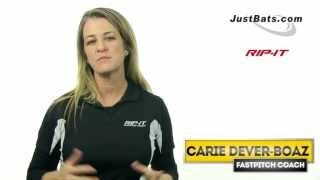 Two-time Olympic gold medalist, Crystl Bustos, hits the 2014 DeMarini Insane fastpitch bat and reviews its benefits. Hi. I’m Crystl Bustos. This is our 2014 CF6 Insane. This is the new CF6 Insane. It has a paradox composite which means it’s hotter out of the wrapper, which means it’s more responsive. We have a diffusion handle which eliminates the vibration which allow you to swing freely without the fear of vibration. Today I hit the bat for the first time. Pulled it right out of the wrapper. It’s very responsive. The diffusion did its job. We were crushing, didn’t feel a thing. Swing freely. Felt really good traveling through the zone. Everything just felt good all the way around about it. You can get the new CF6 Insane at justbats.com and don’t forget from click to hit.